Emblem of Quwat Dir' al-Qalamoun. The emblem includes a Qur'an quotation: "If God supports you, no one can overcome you" [3:160]. That many armed groups have shifted their links and affiliations over the course of Syrian civil war should come as no surprise. Think of all the various rebel coalitions that have been announced and dissolved for a variety of reasons. Yet it should also be remembered that changes in links and affiliations can also occur on the regime side. 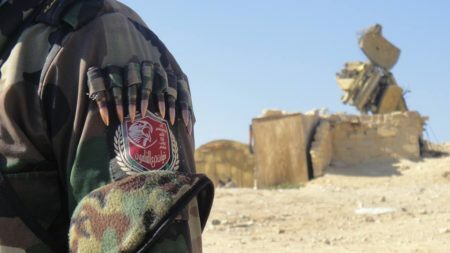 From previous coverage, one case that comes to mind is the small Syrian Shi'i militia known as the Ja'afari Force (aka Liwa al-Sayyida Ruqayya), whose ultimate origins lie in the National Defence Forces. The group then became affiliated with the Iraqi Shi'i militia Kata'ib Sayyid al-Shuhada' and subsequently broke off from that group. Quwat Dir' al-Qalamoun ("The Qalamoun Shield Forces") is of interest for similar reasons. As the name suggests, it is a militia primarily drawing on personnel from the Qalamoun area, large parts of which have been retaken from the rebels by now. The earliest references to the group by this name appear to trace back as far as late 2014. 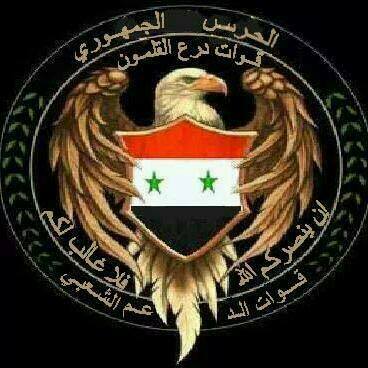 The earliest affiliation that can be clearly identified is the Republican Guard, an elite unit of the Syrian army. 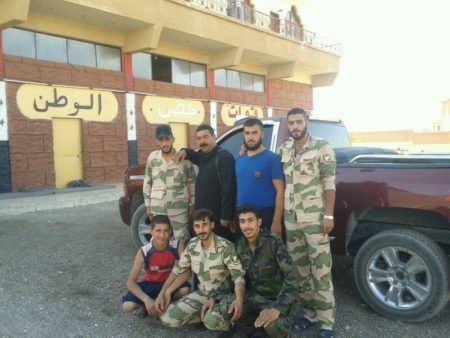 For instance, one post from October 2014 mentions the "Dir' al-Qalamoun, heroes of the guard [i.e. Republican Guard] and heroes of al-Qalamoun." 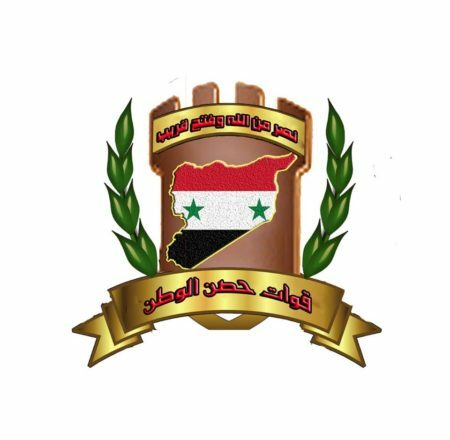 In a similar vein, the earliest emblem of Quwat Dir' al-Qalamoun, as shown in the graphic below, explicitly mentions the Republican Guard affiliation. 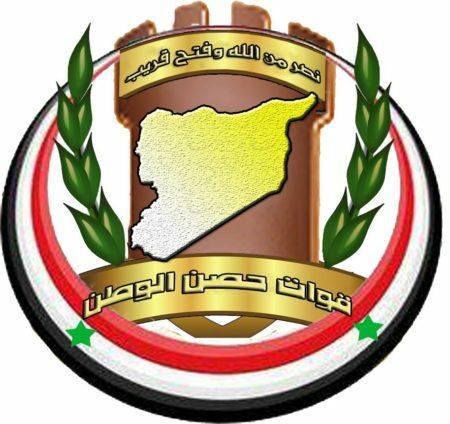 Note in particular that the emblem also uses the moniker Quwat al-Da'am al-Sha'abi ("Popular Support Forces"). A similar name formulation from the Qalamoun area turns up in the Arabic acronym Qadish, which has been used to refer to Quwat al-Da'am al-Sha'abi and Quwat al-Difa' al-Sha'abi. The latter means "Popular Defence Forces," and it appears to be no different from Quwat al-Da'am al-Sha'abi. According to a recent account, a Quwat al-Difa' al-Sha'abi was established on 9 January 2014 in the Qalamoun town of Nabk, which was recaptured from the rebels in December 2013. The formation was set up by notables, retired officers and other locals in coordination with the Republican Guard command, with the aim of coordinating with the security forces in Nabk, aiding the government and state foundations, and preserving private and public property. "The Republican Guard: Quwat Dir' al-Qalamoun. If God supports you, no one can overcome you. Popular Support Forces." Thus, the roots of Quwat Dir' al-Qalamoun can be traced back to wider Republican Guard efforts to mobilise auxiliary forces in the Qalamoun area as areas were retaken from the rebels. Ahmad Khalid al-Qari, an early 'martyr' for Quwat Dir' al-Qalamoun. Originally from Yabroud, he was reported to have been killed in late January 2015. In early February 2015, a group of Quwat Dir' al-Qalamoun fighters from Yabroud were also reported to have been killed, with their bodies found after they had been taken prisoner by rebels in fighting near the Lebanese border. An early brief profile of Quwat Dir' al-Qalamoun can be found from March 2015, describing it as a "faction fighting with the Syrian forces, whose formation was completed by units of the Syrian army, and it is a popular brigade fighting in its ranks from the peoples of the towns and villages of west Qalamoun adjacent to the Syria-Lebanon borders. 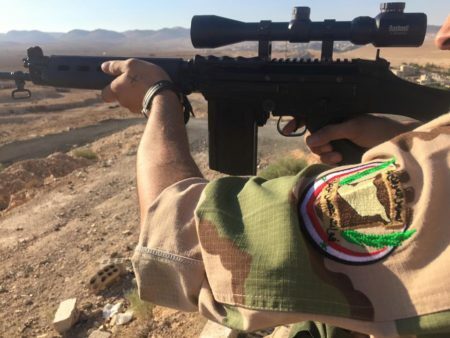 Relevant military sources said that [its] numbers are hundreds of those whose ages range below 30 years old who have rallied within an armed formation organised under the name of the Dir' al-Qalamoun brigade, affiliated with the special forces [i.e. Republican Guard] and wages war alongside its soldiers in the Qalamoun border battles." Quwat Dir' al-Qalamoun continued to pursue operations through spring 2015 in the Qalamoun and wider Damascus countryside areas, with units participating in operations in Jard al-Falita of Jurud al-Qalamoun, as well as operations in al-Nasiriya in the Damascus countryside and securing the gas line in the al-Hadath area (also in the Damascus countryside). As the year progressed, Quwat Dir' al-Qalamoun expanded its operations, participating in extended campaigns in the Aleppo area as part of an advance towards Kweiris airbase (the siege of which would subsequently be broken following the beginning of the overt Russian intervention around the beginning of October 2015) as well as fighting in Harasta to the east of Damascus city and the Maarouneh hills. The operation to capture the Maarouneh hills along with the Harasta highway was declared to have been finished by November 2015. In that same month, Quwat Dir' al-Qalamoun also began participating in operations in the Homs desert against the Islamic State, pushing in the direction of the town of al-Qaryatayn and then returning to that front the following month. Quwat Dir' al-Qalamoun also advertised a role as a force of law and order, claiming to have arrested five thieves on the international route between two localities- Bureij and Hasya- in July 2015. 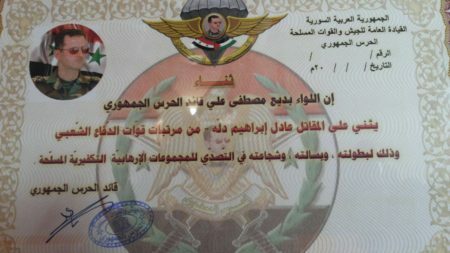 Certificate of commendation from the leader of the Republican Guard- Badi' Mustafa Ali- to Adel Ibrahim Dellah, then the leader of Quwat Dir' al-Qalamoun and originally from al-Dwel'a in Damascus. 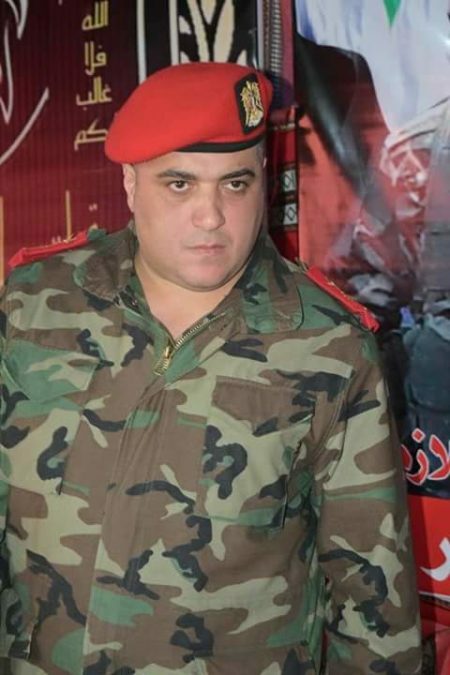 Note he is described here as "from the ranks of the Popular Defence Forces" (Quwat al-Difa' al-Sha'abi), illustrating Quwat Dir' al-Qalamoun's place in the broader spectrum of auxiliary militias raised by the Republican Guard. This document emerged in October 2015. 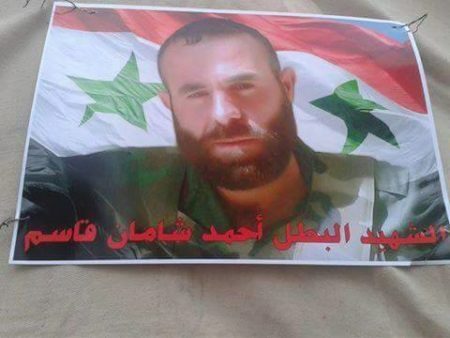 Ahmad Shaman Qasim, a Quwat Dir' al-Qalamoun fighter killed in the Maarouneh campaign. He was originally from the village of Za'ura in the Golan Heights. Israel destroyed Za'ura after conquering the Golan Heights. During this time period, hints of links with the Syrian army's 3rd Division began to appear, as evidence showed the 3rd Division was campaigning in at least some of the same areas as Quwat Dir' al-Qalamoun. For example, here is a case of a 'martyr' for the 3rd Division who was killed in the Harasta area at the end of October 2015. Here also is another 3rd Division fighter killed in the Harasta area in September 2015, as well as more specific evidence from the time showing campaigning on the mountains overlooking the Harasta highway. In addition, the 3rd Division appears to have participated on fighting in the Mahin area in the Homs desert in late December 2015. This would suggest some degree of coordination between the 3rd Division and Quwat Dir' al-Qalamoun in that period. Coordination and links should not come as a surprise: after all, the 3rd Division has bases that amount to an important presence in the Qalamoun area. 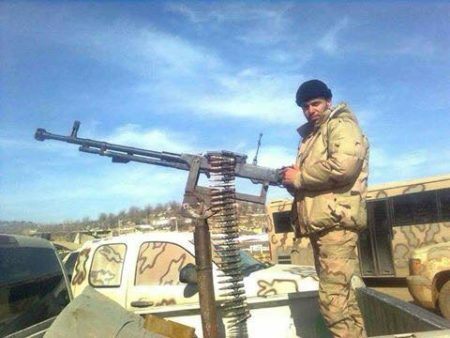 A particular brigade of the 3rd Division that already becomes associated with the brand of Dir' al-Qalamoun is the 81st Brigade (a tanks unit), as shown in posts from December 2015. The links became even clearer in early 2016, as someone emerged in the social media discourse as the mushrif aam ("general supervisor") for Quwat Dir' al-Qalamoun, which in that period was most notably participating in campaigns in Muhassa to the southwest of Qaryatayn. 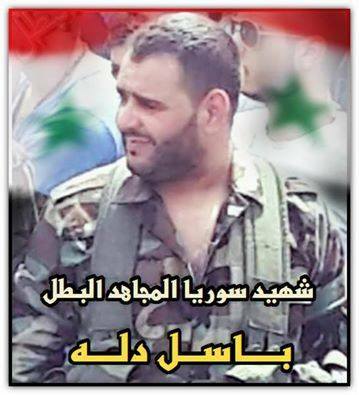 That mushrif aam is Firas Jaz'ah, a Syrian army lieutenant colonel tied to the 3rd Division. Basil Dellah, a Quwat Dir' al-Qalamoun commander originally from the Qalamoun locality of al-Jerajir. He was killed at the beginning of February 2016 in the Mahin area. Following the recapture of Qaryatayn, the next major engagement for Quwat Dir' al-Qalamoun was also against the Islamic State, heading to the Dumayr military airport to the northeast of Damascus in April 2016 in the wake of an offensive launched by the Islamic State. The campaign was presented as being an attempt to root out the Islamic State from its last sanctuary in East Qalamoun. 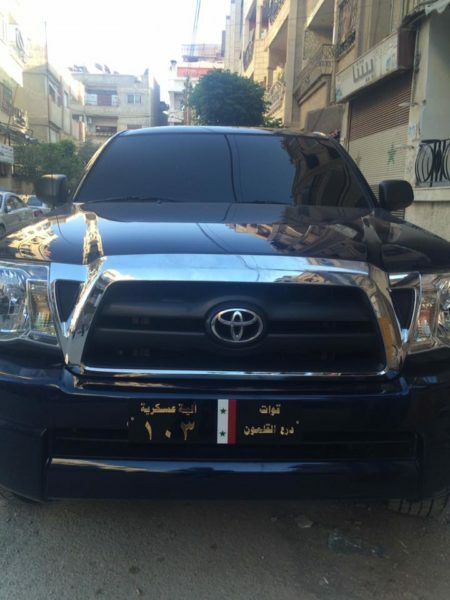 Quwat Dir' al-Qalamoun number plate: "Military Vehicle 103." May 2016 turns out to be a key turning point because it marks a split within Quwat Dir' al-Qalamoun. Specifically, Adel Ibrahim Dellah announced that Quwat Dir' al-Qalamoun would end its relations with the 3rd Division. However, he also made clear in his announcement that some contingents would retain their links with the 3rd Division. Note further the statement's affirmation of Quwat Dir' al-Qalamoun's additional links with entities beyond the Republican Guard and 3rd Division (on which there is otherwise little material available): namely, affiliations with the air intelligence (al-mukhabarat al-jawiya) and the military intelligence (al-amn al-askari: literally "the military security"). Both intelligence agencies have been important actors in raising auxiliary militia over the course of the Syrian civil war. "Statement issued by the leader of Quwat Dir' al-Qalamoun al-Hajj Adel Dellah: Quwat Dir' al-Qalamoun affiliated with the Republican Guard, the air intelligence administration and the military security branch (216) announces the breaking of its links with the 3rd Division-tanks, but we remain companions in arms until the liberation of our homeland together from the filth of terrorism. In that regard, Dir' al-Qalamoun- 3rd Division continues to include the group of al-Jabba, al-Buraij and al-Tawani." For context, 216 is a branch of the military intelligence in the Damascus area, also known as Far' al-Dawriyat. The names of al-Jabba, al-Buraij and al-Tawani referring to contingents of Dir' al-Qalamoun remaining with the 3rd Division are localities in Qalamoun. The reasons for the split are unclear. In contact with the al-Buraij centre for Quwat Dir' al-Qalamoun with regards to this matter, the following response was provided: "These are private matters I will not get into." The Quwat Dir' al-Qalamoun that retains links with the 3rd Division (and the military intelligence, according to the al-Buraij centre) continues to function under the leadership of Firas Jaz'ah, who proceeded to expand recruitment efforts in the wider Qalamoun area, operating training centres in Bada and Deir Attiyeh. Like many other militias, a key incentive to recruit and compensate for the regime's manpower shortages is taswiyat al-wada' ("sorting out of affairs"), which entails an amnesty offered for those who have evaded and abandoned compulsory military service. 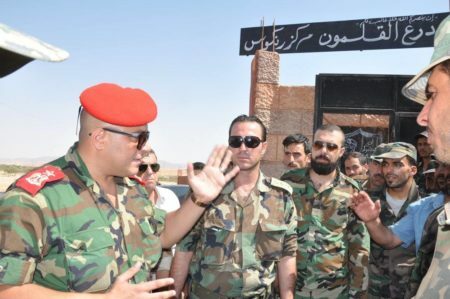 Apparently, growing interest in recruitment for Quwat Dir' al-Qalamoun through this offer led to an extension of the recruitment period in late July 2016 for draft evaders and deserters, with the move blessed by Fahad al-Freij, the overall deputy commander of the armed forces and current minister of defence. The opportunity for enlistment for such people was then renewed in mid-December 2016. A Quwat Dir' al-Qalamoun centre in Rankous. Firas Jaz'ah is in this photo, wearing a red beret. Note that his Quwat Dir' al-Qalamoun has retained the emblem featured at the top of this article. It can be seen in the background in this photo. A Quwat Dir' al-Qalamoun building that also has the 3rd Division name inscribed on it. The Quwat Dir' al-Qalamoun remaining under Firas Jaz'ah and the 3rd Division has participated in a number of engagements, including fighting in the north Hama countryside and being called up as reinforcements to the Palmyra area following the fall of the town of Palmyra to the Islamic State again last month. The fighting in the latter case has been particularly heavy around the important T4 airbase, during which the leader of the al-Jabba contingent (Malek Shafiq Omar) was killed. Quwat Dir' al-Qalamoun is also participating in the fighting in the Wadi Barada area that is a crucial source of water for Damascus and has come to the forefront of media attention recently. 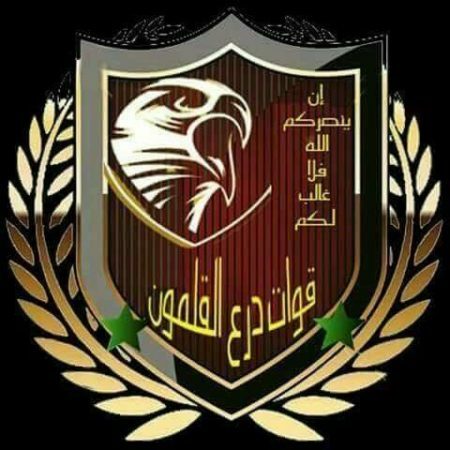 On the other hand, contingents of Quwat Dir' al-Qalamoun that severed links with the 3rd Division evolved into a new group called Quwat Hisn al-Watan ("Homeland Protection Forces"), adopting new emblems as well. Quwat Hisn al-Watan emblem. On top is a Qur'an quotation: "Victory from God and a near conquest" [61:13]. Another Quwat Hisn al-Watan emblem, using the same Qur'an quotation. Quwat Hisn al-Watan insignia, identical with the first emblem. Quwat Hisn al-Watan members posing outside a building bearing the group's name. While Adel Ibrahim Dellah has maintained a military command position within Quwat Hisn al-Watan, the group has acquired a new mushrif aam. 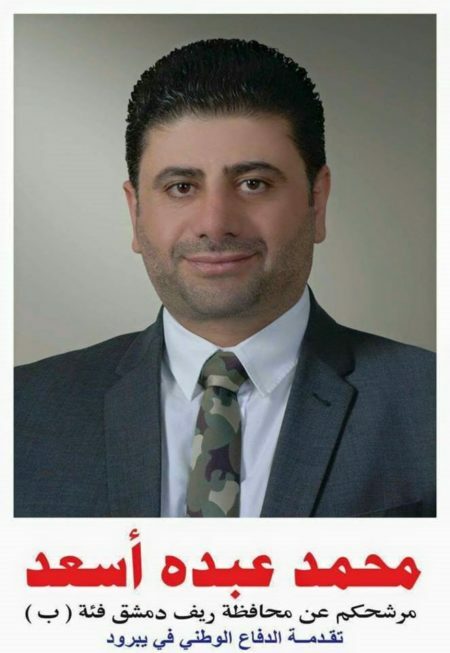 This mushrif aam is one Muhammad Abdo As'ad, who was successfully elected to the People's Council (the Syrian parliament) as a representative from the Qalamoun area in the parliamentary elections last year. Though he appears to have run nominally as an independent candidate, he notably had the backing of the local National Defence Forces (NDF) branch in Nabk. Indeed, the NDF in Qalamoun held celebrations to mark Muhammad Abdo As'ad's election, with one post even referring to him as the Qalamoun NDF's candidate. One should compare with the case of Liwa al-Baqir in Aleppo, which endorsed an officially independent candidate who maintains close links with the militia. 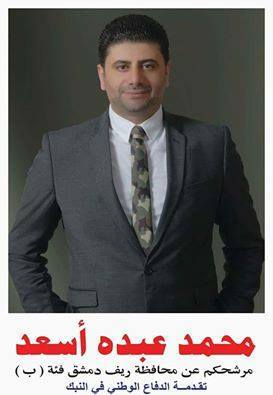 Muhammad Abdo As'ad, endorsed by the NDF in Nabk as a candidate for the parliamentary elections. Muhammad Abdo As'ad, with endorsement from the NDF in Yabroud. Muhammad Abdo As'ad shaking hands with Bashar al-Assad. Quwat Hisn al-Watan has engaged in fighting on multiple fronts since its inception. This has included deployments on the al-Dumayr front, the north Hama countryside and the Harasta highway. The engagement on the Harasta highway has notably involved participation the NDF forces from Nabk and the wider Qalamoun area. As for Quwat Hisn al-Watan's formal affiliation, the available evidence from Quwat Hisn al-Watan-linked sources is somewhat ambiguous although it does point to links with the regime's intelligence agencies in some form. Nothing currently suggests an affiliation with the Republican Guard and the intelligence. Some evidence implies that the group retains an affiliation with the military intelligence, while other evidence points to an affiliation with the General Intelligence (al-mukhabarat al-aama, aka amn al-dawla- "State Security"). 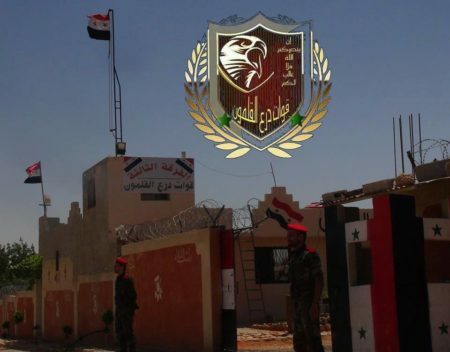 Other posts merely use the term shu'bat al-mukharabat ("intelligence branch"), which by itself is too vague as it can refer to more than one intelligence branch. It may be that Quwat Hisn al-Watan has links/affiliations with both the military intelligence and the General Intelligence. Multiple affiliations at one time should not come as a shock. After all, Quwat Dir' al-Qalamoun before its split- as documented above- had affiliations with the Republican Guard, the air intelligence and the military intelligence, while Liwa Khaybar in Homs (aka Quwat al-Aqrab/Fawj al-Aqrab/Kata'ib al-Aqrab) appears to have links with both the air intelligence and military intelligence. Overall, the history and evolution of Quwat Dir' al-Qalamoun provides an interesting look into how pro-regime militias can develop and shift their affiliations and links over time. In this case we even have a divergence into two militia entities following humble beginnings in Republican Guard auxiliary recruitment efforts in the Qalamoun area as the regime began to retake significant ground in that area from the rebels. Perhaps more importantly, the case of Quwat Dir' al-Qalamoun provides wider insight into how the regime is dealing with areas retaken from the rebels. Much controversy has emerged recently over an article by Martin Chulov reporting on alleged Iranian-backed plans to engineer demographic change in regime-held Syria to reduce the proportion of potentially hostile Sunnis. 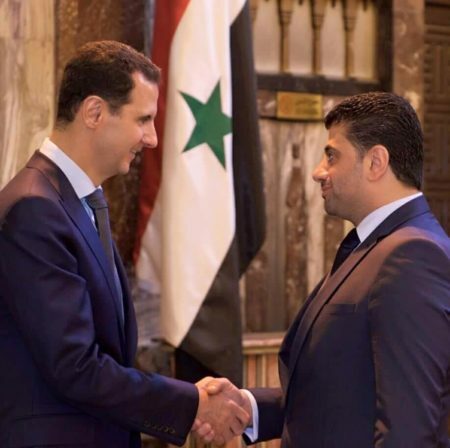 An unidentified "senior Lebanese leader" is quoted in the report as saying that "Iran and the regime don't want any Sunnis between Damascus and Homs and the Lebanese border." Leaving aside the problem that the lack of precise identification of the source means it is impossible to identify the biases, this analysis is an oversimplification. Areas retaken from the rebels are potential sources of additional manpower for the regime, and the Qalamoun area is no exception, and it is not realistic to depopulate the entirety of Qalamoun of Sunnis and somehow hope the deficit can be compensated by influxes of Shi'a. Thus we see how the recruitment efforts in the Qalamoun area have played over the years with multiple actors for the regime participating in the effort, with wider manpower deficits again playing a role partly on account of draft evasion and desertion. Even rebel supporters and those against the regime say that at least some of the recruits into Quwat Dir' al-Qalamoun are ex-rebels, with their estimates of the proportion of ex-rebels in these forces ranging from less than 10% to 50% or more. Besides, Quwat Hisn al-Watan in particular has also promoted the notion of tribal recruitment from the Qalamoun area and elsewhere, as broadcast on one occasion by Sama TV. One should compare pro-regime militia recruitment in Qalamoun with more recent developments surrounding some other remaining rebel bastions to the west of Damascus, like Beit Tema and Beit Saber, where the regime is trying to implement full 'reconciliation' initiatives in these areas, recruiting local rebels who accept taswiyat al-wada' (i.e. amnesty) into a new planned auxiliary militia called Fawj al-Hermon ("The Hermon Regiment"), referring to the prominent Mount Hermon (aka Jabal al-Sheikh) in the area. The village of Beit Jann and its immediate environs, however, took a much more rejectionist stance, with the main rebel factions there being Jabhat Fatah al-Sham, Ahrar al-Sham, the Jabal al-Sheikh Brigades and Harakat Shuhada' al-Sham. That said, as of 17 January 2017, a former Syrian member of parliament and current activist in 'reconciliation' initiatives in the Damascus countryside- Mus'ab al-Halabi- has claimed progress on the Beit Jann case in addition to the Quneitra village of Jubatha al-Khashab bordering the Golan Heights, asserting that more than 1000 people want taswiyat al-wada' while up to 140 people or so want to go to Idlib. It does not follow from all of the above that there is no truth to aspects of the demographic change narrative. Increasing purchases of property in Syria by Iran is very real, along with some Shi'i proselytization efforts. The removal of some rebels and civilians to Idlib, the main rebel-bastion in western Syria now, is very real as well (as documented above). Considerable ethnic cleansing in fighting has also occurred in places like Homs city. However, the regime and Iran cannot wish away the reality of a large Sunni majority in Syria. Multiple approaches are therefore adopted towards dealing with territories retaken from the rebels, one of which includes amnesties and recruitment to pro-regime militias, undoubtedly contributing in the grand scheme to the regime's long-term plan to reconquer the entirety of Syria. (Update 16 July 2018): For clarity, Quwat Hisn al-Watan is affiliated with the military intelligence. It should be noted that the military intelligence is sometimes referred to in discourse (rather confusingly) as the "Shu'bat al-Mukhabarat al-Aama" (General Intelligence Branch) in addition to the titles of al-Amn al-Askari and Shu'bat al-Mukhabarat al-Askariya. Meanwhile, the Amn al-Dawla's proper title is "Idarat al-Mukhabrat al-Aama" (General Intelligence Administration).